This time last year I was enjoying the last trimester of my pregnancy, fully expecting to have another perfectly healthy little baby by summer. What I didn’t expect? 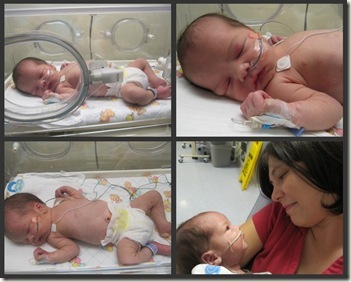 To spend over a month living at McMaster Children’s Hospital with my sweet baby in the NICU! Isaac was my third home birthed baby. 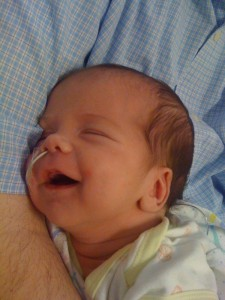 His birth was fairly unremarkable but the following day, Isaac wouldn’t wake up. We immediately went to the ER of our local hospital and a few very scary hours later, Isaac was pretty stable. We spent a couple days there and then, when they couldn’t figure out what was going on with him, we were transferred to McMaster Children’s Hospital. We were involved with nephrology, metabolics, neurology, neurosurgery, ophthalmology and hematology. Isaac had all sorts of blood work, x-rays, a couple MRI’s, an EEG an ECG and and a lot of metabolic testing done. Isaac is our little miracle. He is now 10 months old and doing well though McMaster is still a place we visit on a regular basis for appointments! I’m a #KinderMom and during the campaign I receive Kinder Eggs each month. McMaster is the recipient of our eggs most of the time; sometimes we drop them off to pediatrics and other times to the NICU nursery where the nurses and families can enjoy them. I am so thankful that McMaster has such an incredible team of doctors and specialists, that they have a wonderful neonatal nursery and that they have the equipment and resources there to help millions of families like myself. 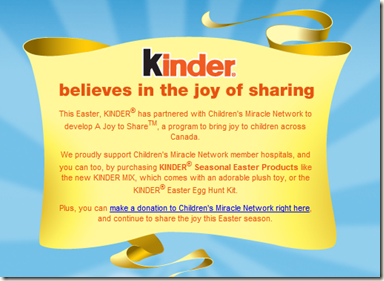 It’s a joy for me to share about Kinder’s ‘A Joy to Share’ campaign in which Kinder has partnered with the Children’s Miracle Network. The Network raises funds for hospitals and McMaster Children’s Hospital is one of the hospitals they raise funds for! Spring is a time of miracles. The miracle of a risen Savior, of flowers blooming, of trees budding. The miracles of birth are all around as baby chicks hatch and lambs are born. As you purchase delicious Kinder chocolate, remember that you are also a part of a miracle! You support Kinder supporting the Children’s Miracle Network means that you were a part of Isaac’s miracle and countless others. So thank you to The Children’s Miracle Network, Kinder and to you! This post is under “Reviews/Giveaways” and has 6 comments so far. On Being Unique and a Kinder Contest!